A superfast research aircraft outfitted with cutting-edge air-monitoring instruments returned today from its inaugural mission in the quest to map the earth’s atmosphere for the first time in fine-grained, three-dimensional detail. The plane, known as HIAPER, collected data while zigzagging up and down through the atmosphere as it flew from the Arctic to the Antarctic. The airplane was flying as part of a National Science Foundation project called HIPPO Global to measure greenhouse gases on a global scale. One of the instruments on the craft was invented by Princeton’s Mark Zondlo, who designed it to measure water vapor throughout the atmosphere. One half of the device — shaped much like the tail fin of a plane — juts out on top of the plane, probing the air as it rushes by the sensor. The bottom half rests inside the interior of the plane and houses a delicately calibrated laser that monitors and records water vapor levels in real time. Although Zondlo is only beginning to analyze the data collected on this first mission, it seems to point to a surprising finding: plumes of very moist air occurring about every 20 degrees in latitude from the Earth’s surface up to nearly the stratosphere. 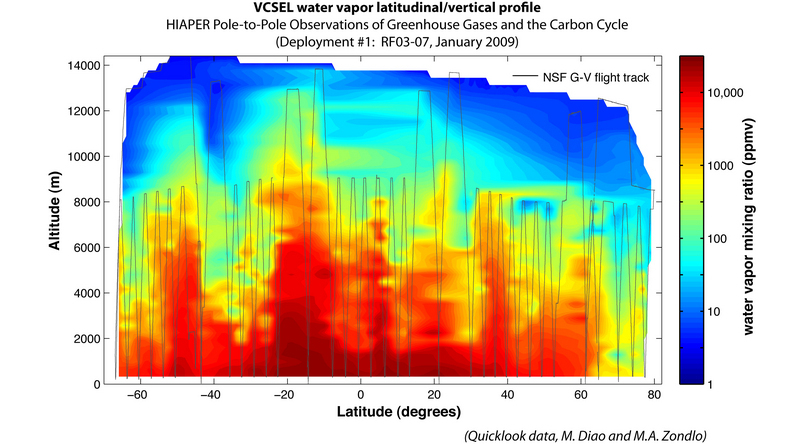 While it may sound innocuous, this moist air – a k a water vapor – is the strongest greenhouse gas in the atmosphere, and human activities are likely changing how much of it makes to the upper atmosphere and how it gets distributed there. "Surprisingly little is known about water vapor because it has been really hard to measure in the upper atmosphere," Zondlo told EQN. "The new data suggests that these plumes are happening at a scale we had not imagined." Zondlo an assistant professor of civil and environmental engineering, is affiliated with Princeton’s MIRTHE center, which conducted air-quality research during the Beijing Olympics using new laser-based sensors. Patrick Regan of NJN News recently interviewed Claire Gmachl and Kale Franz about a new discovery coming out of MIRTHE that could "dramatically improve laser performance," according to Franz. At last count, a techradar.com story on the discovery had more than a thousand Diggs. HIPPO Global has four more missions to go and will examine the atmosphere in other seasons of the year. For more, see CBS News, Bloomberg, Redorbit, and Scientific American. EQN is a blog from Princeton University’s School of Engineering and Applied Science that highlights faculty, students and alumni who, through innovation and leadership, are changing the world.